I have to admit, I was a little surprised that this generically titled slot from slot developer Bally Technologies came from their Las Vegas offices because they are usually very creative with their slot titles. You just have to look at their popular Wild Huskies slot and the Egyptian-themed Pharaoh’s Dream slot to see that they do like a themed slot. However, this plays on the basic theme of money and winning that money! This is an interesting release from Bally Technologies because fans of its land-based predecessor will notice that it was a 3 reel title but this online conversion is a 5 reel, 243 ways to win slot that still possesses a lot of the qualities that the land-based slot has. The symbols across the reels are not exactly mind-blowing with a range of gems and jewels such as emeralds, rubies and diamonds making up the symbols plus the regular 9 through to Ace symbols filling up the reels. There is also a dollar sign symbol and a standard Wild symbol that substitutes for all other symbols except for the bonus symbols to complete winning combinations. There is also the U-Spin Wheel Bonus symbol that is the key to triggering the U-Spin Wheel Bonus. 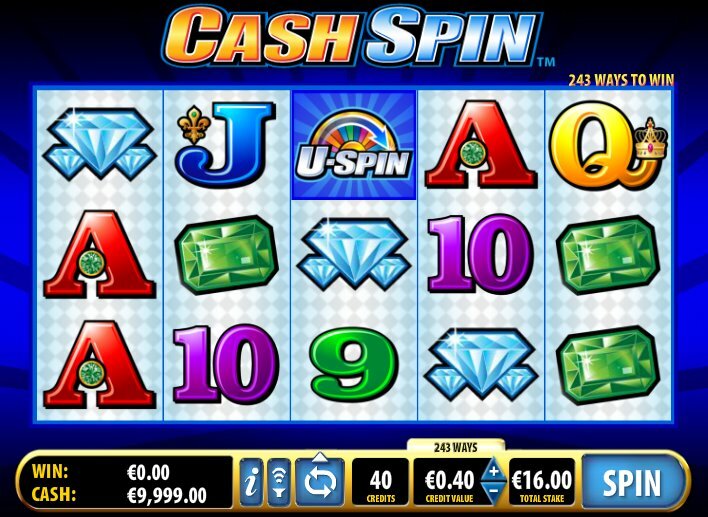 If you hit three or more of the U-Spin Wheel Bonus symbols across the reels you will be taken to a second screen where you will get to play a Wheel of Fortune style game where you must spin the wheel that is divided into different sections offering a range of cash prizes and free spins. The wheel will then spin at a speed depending on how quick you use your mouse to spin it and will then land on a section to reveal a prize. You will either win a cash prize or at least 12 free spins. There is also a Moneybags Bonus that is triggered if you hit three or more Moneybags symbols across the reels. This will again take you to a second screen where you must pick from one of three moneybags to reveal a prize. After you have picked which moneybag you want the slot will then reveal your prize but also reveal what you could have won if you had picked one of the two other moneybags. Cruel game, cruel, cruel game! 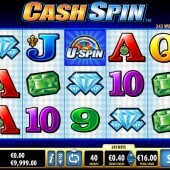 Cash Spin is one of the more enjoyable slots that Bally Technologies have released online and maybe it is because they have had to alter it slightly to be more appealing online because the land-based version just wouldn’t have converted effectively. The presence of an interactive bonus round, the chance to win free spins plus a Pick ‘em Bonus is great news to bonus fanatics and I feel it is just a progressive jackpot away from being in the same ball park as NetEnt’s millionaire-maker Mega Fortune. Good work Bally! You’re starting to get the hang of this online slots malarkey.